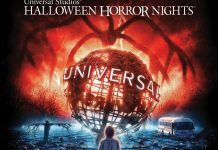 Ladies and gentlemen, consider yourselves warned – for the first time ever, the bad boys of magic, Penn & Teller, are bringing their eccentric and edgy illusionist entertainment to life in an all-new 3D haunted house – “Penn & Teller New(kd) Las Vegas” – at Universal Orlando Resort’s horror-inducing, award-winning Halloween Horror Nights event. Prepare to experience the lights and allure of Las Vegas… with a toxic twist. For more than 35 years, Penn & Teller have redefined the magic genre, specializing in gory vaudeville-like tricks, exposing frauds and performing inconceivable stunts live in front of sold-out crowds. 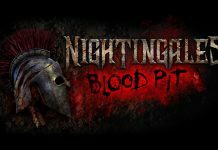 And now, they’re partnering with the designers at Universal Orlando’s Halloween Horror Nights to infuse their brand of entertainment in a complete haunted house environment – something they have never done before. Best known for their satirical humor, outrageous antics and mind-blowing magic, including their famous “The Magic Bullets” trick (where the duo catch bullets in their teeth), the pair has entertained guests at Las Vegas’ Rio All-Suite Hotel & Casino for more than 10 years, making their act one of the longest running and most-beloved shows in Las Vegas history. This fall, Penn & Teller invite Halloween Horror Nights guests to step into a dark, dilapidated and radioactive version of “Sin City,” as if one of their magic tricks has gone terribly awry and the city has been covered in nuclear ooze. Concepted by the duo themselves, the maze will feature the best of Vegas – showgirls, slot machines, little white wedding chapel, all-you-can-eat buffet, and more – all glowing with a toxic green hue. Penn & Teller have earned an impressive 13 Emmy Award nominations for their long-running Showtime series, “Penn & Teller: BS!” They have also written three New York Times best-sellers and had two successful Broadway show runs. They’ve both also recently appeared on numerous television shows, including “Celebrity Apprentice,” “Dancing With The Stars” and “Top Chef;” and were selected to receive a star on the Hollywood Walk of Fame in 2013. 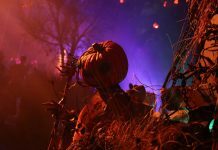 For more information about Halloween Horror Nights at Universal Orlando Resort, visit Universal Orlando Halloween Horror Nights.